My eyes lifted to the horizon and the unmistakable snowy outline of Everest. Everest, the mountain of my childhood dreams. A mountain that has haunted me my whole life. A mountain I have seen hundreds of times in photographs and films but never in real life. In April 2018, seasoned adventurer Ben Fogle and Olympic cycling gold medallist Victoria Pendleton, along with mountaineer Kenton Cool, took on their most exhausting challenge yet - climbing Everest for the British Red Cross to highlight the environmental challenges mountains face. It would be harrowing and exhilarating in equal measure as they walked the fine line between life and death 8,000 metres above sea level. For Ben, the seven-week expedition into the death zone was to become the adventure of a lifetime, as well as a humbling and enlightening journey. For his wife Marina, holding the family together at home, it was an agonising wait for news. Together, they dedicated the experience to their son, Willem Fogle, stillborn at eight months. Cradling little Willem to say goodbye, Ben and Marina made a promise to live brightly. To embrace every day. To always smile. To be positive and to inspire. And from the depths of their grief and dedication, Ben's Everest dream was born. Up, from here the only way was Up. 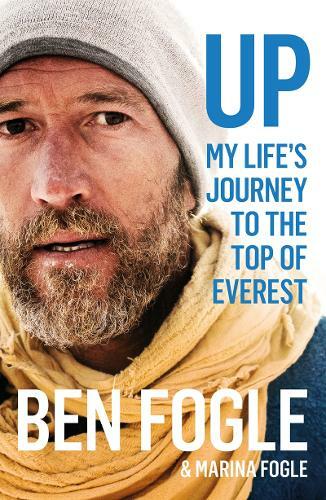 Part memoir, part thrilling adventure, Ben and Marina's account of his ascent to the roof of the world is told with their signature humour and warmth, as well as with profound compassion.